Christian Medical College, Ludhiana was the first medical college for women in Asia. Established in 1894, CMC, Ludhiana is run by a minority Christian community. It is one of the popular private medical colleges in Punjab founded by Dame Edith Mary Brown. It is affiliated to Baba Farid University of Health Sciences, Faridkot and recognized by MCI. It is registered under the name-The Christian Medical College and Hospital that also run a dental, nursing and allied health sciences college along with CMC medical college. In this article, you will get all the important details related to admission in CMC, Ludhiana. Note- Fee structure is based on previous year’s data and is subject to change as per rules and policies of the university. G- Service Commitment with CMC, Ludhiana & its Outreach Centres. Nationality- Candidate must be an Indian citizen. NRI, OCI, Foreign National, and PIO are also eligible for admission in MBBS and BDS. Age Criteria- Candidate’s age must be of 17 years as on 1 December 2018. Qualification Criteria- Candidates must have qualified 10+2 exam with minimum 50% marks (40% for SCL/ST). They must have qualified Physics, Chemistry, Biology, and English individually in 10+2. Candidates must have qualified NEET. Candidates must be an Indian National. NRI and PIO candidates are also eligible. Candidates must have a MBBS degree from a recognized college. Candidates must have a MD degree from a recognized University. Candidates must have a MS degree from a recognized university. NEET candidates have to secure the minimum percentile (minimum Marks required) finalized by CBSE in order to qualify the exam and secure admission in a medical college. Admission in CMC, Ludhiana will also be granted on the basis of same criteria. Category-wise qualifying percentile of NEET 2018 needed for admission in MBBS courses is given below. CMC, Ludhiana grants admission to the candidates in MBBS on the basis of NEET scorecard. 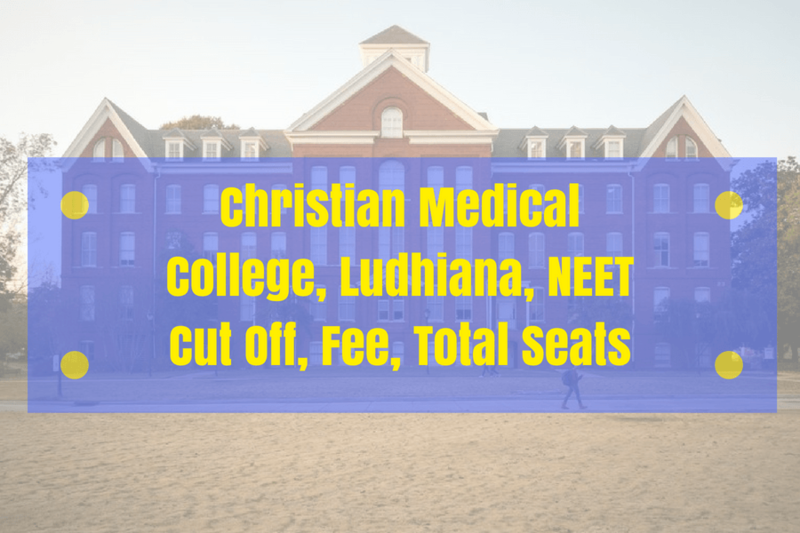 Christian Medical College, Ludhiana will release its MBBS merit list and after that candidates will be called for counseling. Baba Farid University of Health Sciences, Faridkot is the authority responsible for conducting NEET UG counseling of filling seats in CMC, Ludhiana and other medical colleges of Punjab. Apart from MBBS, admission in other courses like MD/MS/PG Diploma and DM/MCH is granted on the basis of NEET PG and NEET SS respectively.